Exercise caution when dealing with jellyfish, as they can be deadly. If you have been been severely stung by a jellyfish, go to the hospital immediately. Believe it or not, one of the most dangerous species lurking in the water at your family beach are jellyfish. Jellyfish stings happen often while swimming in the ocean because jellyfish are so difficult to see underwater. Although you may be able instruct your family and friends to stay away from jellyfish on the shore, sometimes getting stung is inevitable. 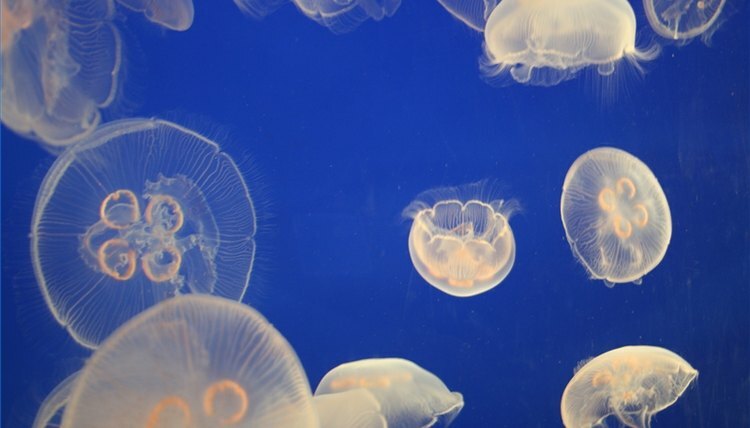 It can be possible for a jellyfish to become stuck inside of swimsuit or a boat and although it is not recommended to touch a jellyfish with your bare hands, sometimes contact must be made in order to safely remove the jellyfish from the area. Follow the steps outlined here in order to touch a jellyfish without getting stung. If you have a pair of rubber gloves handy, put them on. Jellyfish will not be able to sting your skin through the rubbery surface of the gloves and they will provide a barrier between you and the slippery jellyfish, so you will be less likely to drop it. Remove the rubber gloves after using and throw them away. If rubber gloves are not available, find a small net and scoop up the jellyfish. It may be more difficult to get a jellyfish out of small spaces by using a net. Clean the net thoroughly after using. If a net is not available, wet a T-shirt and pick up the jellyfish with the T-shirt wrapped around your hand. Because the jellyfish will be incredibly slippery, this is not an ideal way to pick it up, but will work if no other options are available. Throw away the T-shirt after using. If there are no tools available to pick up the jellyfish, you may need to use your bare hands, but be cautious. The potency of the jellyfish's poison depends on the species of jellyfish. Most small jellyfish species can be picked up very gently and carefully with the tips of your fingers. Only pick up the very top, where the jellyfish has a small patch of ballooning skin. Only pick up a jellyfish with your bare hands in extreme emergencies, as many species of jellyfish stings can be very dangerous and even deadly. If you do obtain a jellyfish sting while picking up the jellyfish, have a first aid kit handy. Rinsing the sting with cool water will keep the irritation from spreading and soothe the sting. Apply a topical hydrocortisone cream to the sting to stop swelling and take Benadryl as needed. If the sting is severe and causes extreme swelling, go to the hospital.